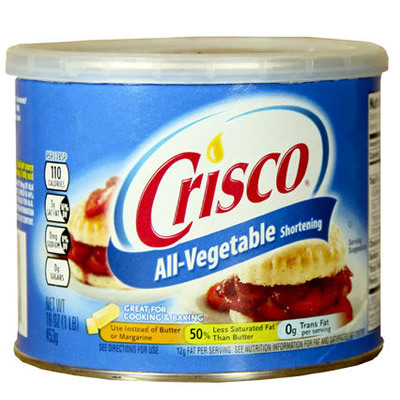 Crisco is a familiar brand of Partially Hydrogenated Oil (PHO). PHO is vegetable oil in a solid form at room temperatures. To make PHO, vegetable oil is placed in the presence of hydrogen and a catalyst. During this process, the C=C bonds are dismantled, forming a solid fat which increases the melting point of the ingredient. This results in incomplete hydrogenation which partially converts the oil to trans isomers, forming trans fat. In the 1890s, Nobel laureate Paul Sabatier discovered the chemical process for the hydrogenation of vapors. In 1901, Wilhelm Normann showed that liquid oils could be hydrogenated. In 1909, Procter & Gamble acquired the US rights to the Normann patent, selling the first hydrogenated shortening under the brand name Crisco®. Also, during the partially hydrogenation process, trans-fatty acids are formed due to the cis/trans conversion on positional shifted in the fatty acid chain. PHOs is very versatile in all pastry, cookie and frosting applications. Baker’s who are seeking to replace the PHOs in their formulas can now find alternatives. Palm kernel oil is the most prevalent alternative for PHOs today, as it provides similar structural integrity. Based on new scientific evidence and the findings of expert scientific panels, the Food and Drug Administration (FDA) has tentatively determined that partially hydrogenated oils (PHOs), which are the primary dietary source of industrially-produced trans fatty acids, or trans fat, are not generally recognized as safe (GRAS) for any use in food based on current scientific evidence establishing the health risks associated with the consumption of trans fat. Center for Science in the Public Interest. “About Trans Fat and Partially Hydrogenated Oils.” 18 May, 2004. http://cspinet.org/new/pdf/trans_q_a.pdf. Accessed 21 June 2017. Karabulut I, Kayahan M, Yaprak S. “Determination of Changes in Some Physical and Chemical properties of Soybean Oil During Hydrogenation.” Journal of Food Chemistry. 2003. (81) 453-456. Lee, Jeung Hee, Casimir C. Akoh, and Ki-Teak Lee. “Physical Properties of Trans-Free Bakery Shortening Produced by Lipase-Catalyzed Interesterification.” Journal of the American Oil Chemists’ Society 85.1 (2007): 1-11. Mozaffarian D, Jacobson M, Greenstein J. “Food Reformulations to Reduce Trans Fatty Acids.” The New England Journal of Medicine. May 27, 2010. 362;21. “Final Determination Regarding Partially Hydrogenated Oils.” Federal Register. 17 June 2015. www.federalregister.gov/documents/2015/06/17/2015-14883/final-determination-regarding-partially-hydrogenated-oils. Accessed 23 June 2017.